Stories tagged with "Materials Science And Engineering"
Igor Luzinov of Clemson University Monday became the first recipient of the Kentwool Distinguished Professorship in Natural Fibers, an honor named for a 176-year-old textile company that remains committed to innovation and excellence in natural fibers, specifically wool. A $250,000 gift from Kentwool in 2009 enabled Clemson to receive a matching gift from the lottery-funded SmartState program creating the endowment that made the professorship possible. Kentwool is headquartered in downtown Greenville, South Carolina, and has a 135,000-square-foot yarn production plant in Pickens County. A Clemson University alumnus who traveled the world and worked at Savannah River National Lab before returning to his alma mater as an associate professor is taking the helm of a department that plays a central role in one of the university’s research priorities. Kyle Brinkman is the new chair of the materials science and engineering department, the academic home to about 260 students and 17 faculty members. The appointment takes effect March 1. 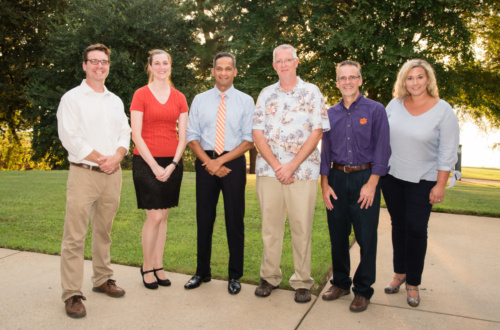 The Clemson University Research Foundation (CURF) has announced seven researchers will receive Technology Maturation Fund grants to support the last critical step in technology development. The projects supported by this fund include prototype and minimal viable product development, bench-to-scale-up activities to generate material samples for application testing, beta field testing and pre-clinical studies. Cars that go more than 1,000 miles on a single fill-up and smartphones that can run for days without recharging are among the possibilities that could come out of a new Clemson University research project that brings together 3D printing and laser processing. The cost of making plastics, paints, coatings for cell phone screens and other materials that heal themselves like skin could be dramatically reduced thanks to a breakthrough that a Clemson University team detailed in the latest edition of the journal Science. Annoyed by that crack on your phone’s screen? You wouldn’t be if the screen could heal itself, like a body heals a cut. That day is coming. Research and development in this area is so popular now that today’s advice to Benjamin Braddock would be two words: self-healing plastics.